Celebrating 20 Years of Free Family Fun at The Regatta at Lake Arthur | Visit Butler County Pennsylvania! As The Regatta at Lake Arthur sails into its 20th year, Grove City College students chose this annual event for a writing project. Read below to learn more about The Regatta, event details and why this event at Moraine State Park is so unique. Looking for a fun free family weekend? Come celebrate the 20th anniversary of the Regatta at Lake Arthur on August 4th and 5th with a weekend of outdoor excitement. The Regatta offers numerous watersports and land activities for the entire family, pets included. Its immense growth over the past five years has strengthened the community bond, gathering families to celebrate the outdoors. Established in 1998, the Regatta at Lake Arthur began in hopes of drawing the community to Moraine State Park. The mission statement of the Regatta is “to be the premiere, all-ages, eco-recreational event in the region.” Offering events from a car-cruise to children’s crafts, the Regatta has events that appeal to all ages. The team’s goal, according to Event Director, Holly Muchnok, is to encourage people to “get out and get active.” Attending families not only travel from local regions, but also from surrounding states such as Michigan and Maryland. Located on the South Shore of Moraine State Park in Butler County, Pennsylvania, the Regatta draws crowds to the waterfront. Welcoming people of all ages, the event includes free parking. Food vendors offering various styles of food will keep the crowds fed throughout the day. The fun begins with a welcome to kick off the Regatta on Saturday morning. Numerous events, both on land and water, follow, such as competitions, crafts, and live entertainment. Take a break from water activities, relax in the picnic area, and enjoy some music from local performers. Each evening, there is a grand finale. Fireworks light up the sky on Saturday evening, attracting thousands of people. On Sunday, a “celebration of the ecology and the environment” occurs through a massive release of monarch butterflies, Muchnok says. These butterflies are often released in memory of a loved one. In accordance with tradition, local celebrities are often present at this release. SummersCool is one of the most popular events for the entire family, providing instructional opportunities in the form of lessons taught by local experts. 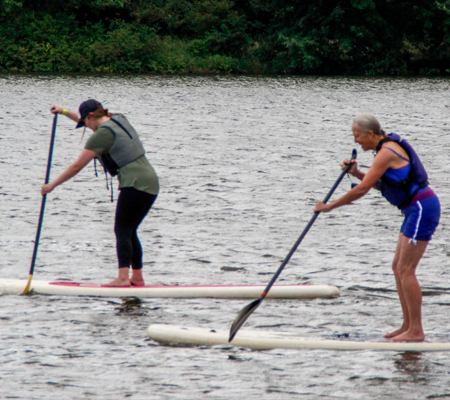 Throughout the weekend, instructors teach standup paddle board, standup paddle board yoga, yoga, fly casting, kayaking, fishing, rowing, and provide boat rides. Not only does SummersCool have a plethora of activities, but it is all free for attendees. Pre-registration and waivers for all of the activities and lessons are available on the Lake Arthur Regatta website to complete prior to participation. Muchnok considers the “fun, exciting, [and] educational” activities of SummersCool the biggest hit of the weekend with thousands of participants in years past. An equally anticipated event as SummersCool, DockDogs takes place from the early to late afternoon on Saturday and Sunday. 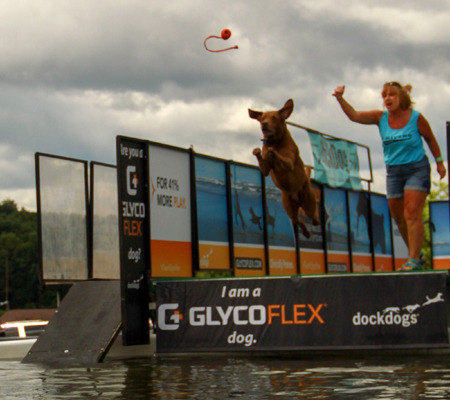 DockDogs’ debut appearance was last year in 2017, and it was a huge success. All dogs are welcome to participate in these competitions as they compete for the longest and highest jumps. A dog competing in the 2017 DockDogs competition. After an afternoon of DockDogs and paddle boarding or yoga, the Car Cruise is a great next stop for attendees. Another event geared towards the whole family, but a senior citizen favorite, the Car Cruise will be located at the Point Picnic Area for the weekend. Included in the weekend are featured business, food, and craft and merchandise vendors. For those with dietary restrictions, there are vegetarian and gluten-free options. From gyros and apple dumplings to Asian cuisine, the entire family can chow down while wandering through the pop-up boutiques. Vendors such as Lularoe with Ashley Bystricky and WestPark Alpacas create a diverse marketplace environment to explore. The Battle of the Bands performances headline on Saturday. Besides the competition, there are surrounding stages with music targeted toward all audiences. For specifics on headliners and performances, the schedule can be found on the Lake Arthur Regatta website under the “Entertainment” tab. These attractions are open to everyone of all ages and are why many families keep coming back. The Regatta offers activities for everyone in the family. Families enjoy the Regatta enough to plan their summer vacations around the event. Their loyal fan-base is comprised of families from surrounding counties and out-of-state attendees. The event has become such a staple in their summer that people come from Michigan, Ohio, West Virginia, and Maryland to get a piece of the fun. Already, the Regatta attracts upwards of 20,000 visitors a year, mostly by word-of-mouth and social media. This year, the committee hopes to attract new visitors with even more family-focused and educational offerings aimed to expand the Regatta’s festivities. In this 20th year celebration, new events coming to the Regatta including a Bike Rodeo Obstacle Course, a Family 5K Nature Walk, and an Education Tent sponsored by The Moraine, McConnell’s Mill, and Jennings Commission (3MJC) and the Moraine Preservation Fund. These additions will be a “phenomenal way to experience the park on a multitude of levels,” Muchnok says. The education tent will teach visitors about the park’s ecology and park operations. The Moraine Preservation Fund will also offer boat rides on their boat, Nautical Nature, so attendees can learn more about the birds and wildlife found in Moraine State Park. These rides will allow visitors to get an up-close view of where these animals make their habitats. With so much to do, the Regatta at Lake Arthur is really “twenty events in one.” Despite the many organizations supporting the Regatta, volunteers are still needed. Volunteer information can be found under the “Volunteer” tab on the Regatta’s website. The Regatta at Lake Arthur is an event for the whole community, meant to celebrate the outdoors and foster community. You can be a part of this free, family-fun-filled weekend. Come have fun at the 20th annual Regatta at Lake Arthur on August 4th and 5th. To sign up for SummersCool or view the 2018 event schedule of events, visit http://www.lakearthurregatta.org/.